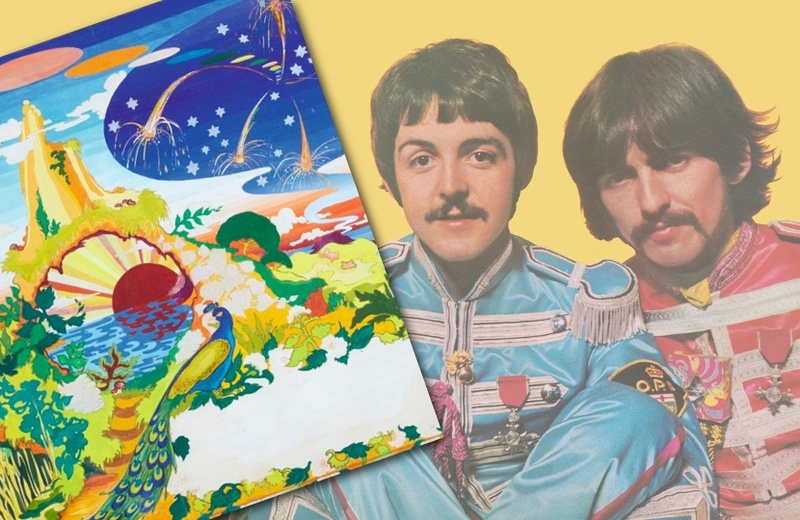 A psychedelic painting created as the original album artwork for The Beatles classic Sgt Pepper’s Lonely Hearts Club Band is up for sale at Sotheby’s. The unused artwork, by Dutch art collective The Fool, is expected to sell for more than $100,000 during an online auction which begins this week. The sleeve for the 1967 album is amongst the most famous in music history – but it could originally have looked very different. The iconic cover, filled with cardboard cut-outs of historical and famous figures, was created by artist Sir Peter Blake and his wife Jann Haworth, using an original concept sketch by Paul McCartney. 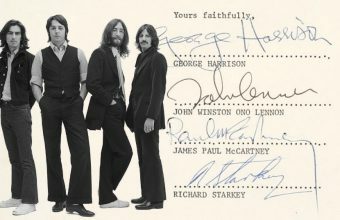 The album was also the first rock record to feature the lyrics to every song on the reverse of the sleeve. But the band decided to release the album with a gatefold sleeve, giving them twice the space of a conventional LP, and commissioned a Dutch art collective known as ‘The Fool’ to create the central artwork. “…The Beatles’ roadie, Mal Evans, brought John and Paul to our studio in St Stephen’s Gardens,” said Marijke Koger, one of the founding members of the group. Having been introduced to LSD in 1965, the Beatles were becoming well-versed in psychedelic imagery, and they felt The Fool’s work captured the spirit of the age. 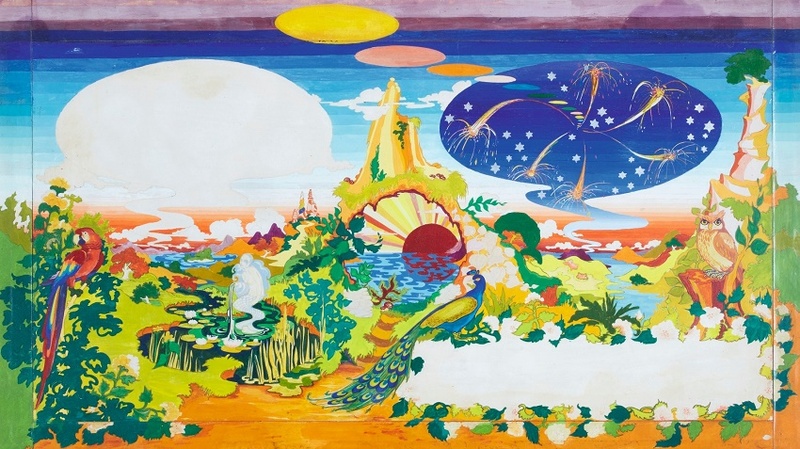 In return, the group created a vivid dreamscape filled with flowing water, towering mountains, green foliage and colourful birds such as parrots and peacocks, all surrounding a blazing sunset. However, the style of the artwork didn’t sit well with Blake’s cover, or the faux-Edwardian imagery McCartney had originally envisioned, and in the end the band rejected the painting. The band eventually chose this famous portrait by Michael Cooper for central the gatefold image. Despite not using the painting, The Beatles remained fans of The Fool’s work and forged a close relationship with them. Later that year they created the outfits worn by the band in the 1967 television broadcast of ‘All You Need Is Love’, and those worn in the ‘I Am the Walrus’ section of their Magical Mystery Tour movie. 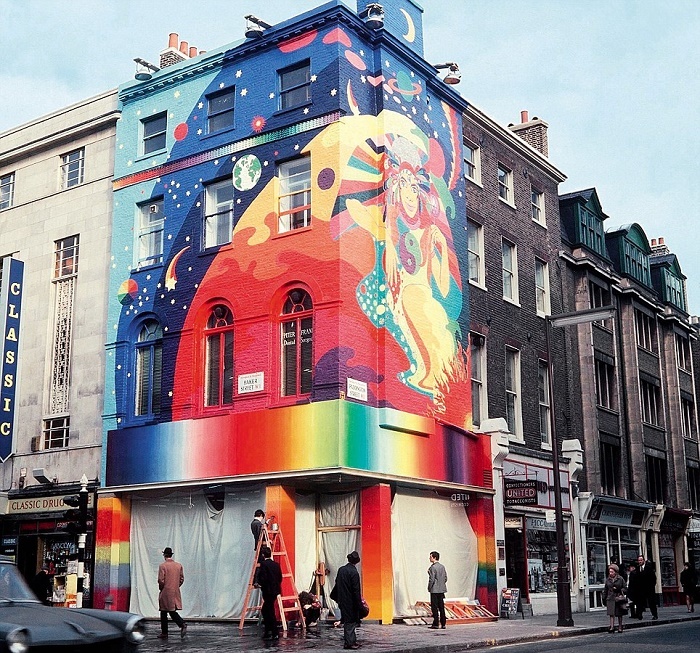 The group also painted a huge three-story mural on the front of the Apple Boutique in London’s Baker Street; gave new psychedelic paint jobs to George Harrison’s custom Mini Cooper and John Lennon’s gypsy caravan; and painted instruments including several of Harrison’s guitars and Lennon’s piano. The Beatles’ Apple boutique, featuring a massive mural by The Fool, which opened in London in 1967 and lasted just eight months. Not only is the painting an important piece of Beatles memorabilia from a landmark moment in pop culture history, but it also has a rather significant former owner: Ringo Starr himself. Starr acquired the painting in the mid-1980s, and later presented it as a gift to his manager Hilary Gerrard in 1987. He even signed the reverse “To Hill | We Love you | Billy S.”, in reference to his Sgt Pepper alter ego Billy Shears. Therefore it’s no surprise that the painting comes with a pre-sale estimate of $77,500 – $116,500 – but could go far higher by the time bidding concludes on December 10. 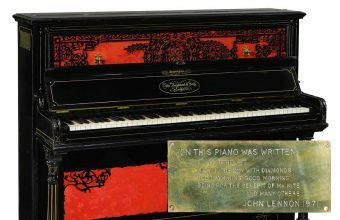 Memorabilia relating to the Sgt Pepper album sleeve is highly sought after by collectors, and can achieve high sums whenever items appear on the auction block. 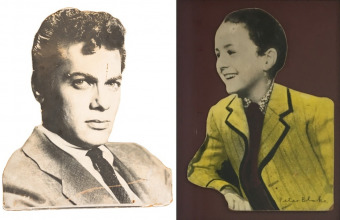 Notable sales have included Peter Blake’s original artwork for the album’s cardboard insert, featuring a cut-out moustache, military stripes and badges, which sold at Sotheby’s in 2012 for $87,800. 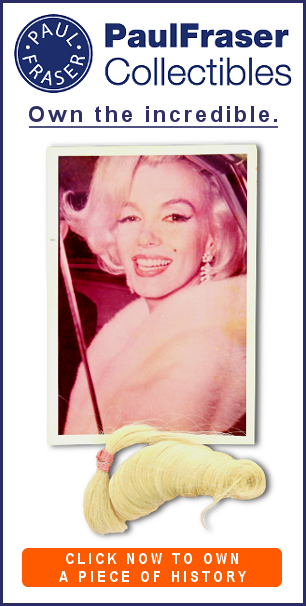 Original props used in the famous cover shoot have also sold well, including a cardboard cut-out of Marlene Dietrich ($137,300); a wax bust of Diana Dors ($19,000); and a doll wearing a Rolling Stones sweatshirt ($16,800). But by far the most valuable item is the drum-skin featuring the album’s title, hand-painted by fairground artist Joe Ephgrave, which sold at Christie’s in July 2008 for $1.07 million.